This is history people! Great 1950s demo tape version of the Billy Lee Riley classic with a frantic live recording on the flip side. 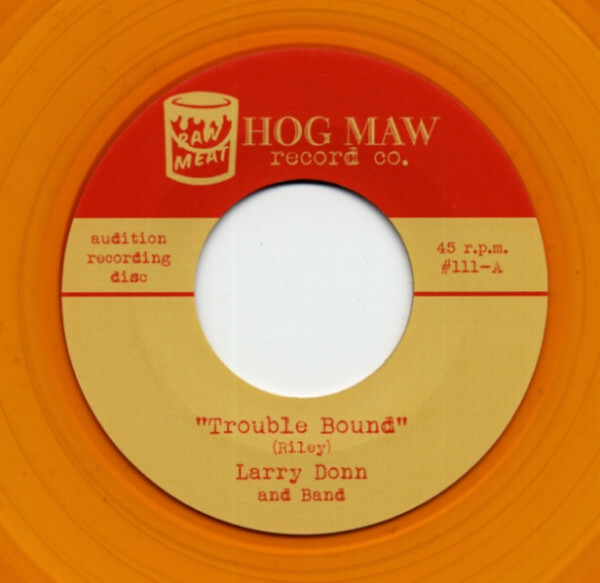 Rockabilly artist born in Bono, Arkansas in 1941, whose full name was Larry Donn Gillihan. He was best known for the 1959 classic, 'Honey Bun' [Vaden 113]. Nowadays, a mint copy of this single will cost you at least £200. From the early '90s, he wrote a great rockabilly column in the UK magazine, 'Now Dig This', and in 2006 released a new album called 'Burning!'. Sadly he died in 2012, aged 70. It could be that this album was originally going to be titled Gimme That Good Old Southern Rock'n'Roll, as this name appears on the back cover. It was recorded at Kennett Sound Studio in Kennett, Missouri between January 1976 and April 1978. Recorded at Moon Studios in Croydon, England on 9 May 2000 during a UK and European tour. Here Donn is backed by Rob Glazebrook (guitar), Wayne Hopkins (bass) and Ritchie Taylor (drums). Customer evaluation for "Trouble Bound b-w Rockin' Love 7inch, 45rpm"